Received from Paul. E. Williams. "A History of Clay County, Indiana: Closing of the First Century's History of the County, and Showing the Growth of Its People," v. I, p.193. according to the official plat of the survey of the said Lands, returned to the General Land Office by the SURVEYOR GENERAL, which said tract has been purchased by the said Amos Hedge Wright . . . .
Millard Fillmore, President of the United States . . . the tenth day of December in the Year of our Lord one thousand eight-hundred and fifty . . ."
Bureau of Land Management, General Land office Records: "Andrew Deal, 40 Acres in Putnam County, Patent issued 1 Feb 1839 at Vincennes, IN Land Office." according to the official plat of the survey of the said Lands, returned to the General Land Office by the SURVEYOR GENERAL, which said tract has been purchased by the said Andrew Deal. . . .
Martin Van Buren, President of the United States . . . the first day of February in the Year of our Lord one thousand eight-hundred and thirty-nine . . ."
Copied from "Family Maps of Putnam County, Indiana"
In order to sell the land with a clear title, it was necessary for the administrator of the estate to establish via the lawsuit that the immediate heirs, Andrew Deal's widow and children, henceforth had no legal interest in the property. Year of birth: 1840 or 1839? Name of father: Henry or George or both? Birthplace of father: Ireland or Kentucky? 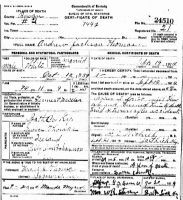 Surname of mother: Bohannon or Buchanan? Indianapolis News, 21 Mar 1927, p. 20. "Died. PERSINGER--Mary, beloved wife of Lewis Persinger, passed away Sunday, March 20. Private funeral--account of contagious disease. Burial--Crown Hill."